The day itself, which honors the Eucharist, is an important one in predominantly Catholic countries such as Italy, but the celebrations here extend far beyond church services. Over the weekend, many towns hold an infiorata in which flower petals are arranged into art, creating stunning street mosaics that last mere hours. 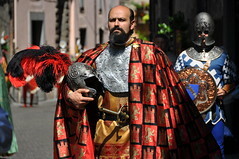 Spello, a tiny town near Assisi, has one of the most famous of these festivals, and I had wanted to go, but it conflicts with the parade in Orvieto, and in the end, I decided to attend the latter instead. And so here I am, waiting for the funicular to take me to the town at the top of the hill. According to tradition, a religious miracle occurred here in 1264. When a priest on a pilgrimage to Rome stopped at a church in nearby Bolsena to celebrate mass, he is said to have witnessed the Host bleeding. A piece of the habit he wore that day—known as a corporale—was stained by the blood, and to this day it is kept in Orvieto’s cathedral. 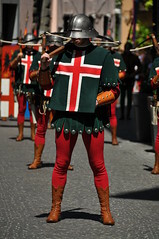 Once each year, the relic is taken through the streets of the city in a lengthy procession that includes hundreds of men, women, and children in medieval costume. It’s just after 10 when I reach the top and rather than wait for a bus, I decide to hurry as best I can down Corso Cavour, navigating from a flimsy map I printed out from home, and the low rumble of drums in the distance. The parade is already under way. 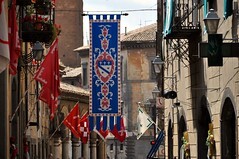 I approach the cathedral from behind and slip along the barricades into a doorway along Via del Duomo, near the piazza. I barely have time to glance up at its glorious façade—which guidebooks hail as a masterpiece of the Late Middle Ages—when the first heralds arrive with their trumpets. They are followed by a swirl of sights and sounds that set my camera’s shutter into high speed. 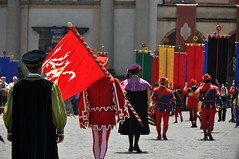 There are waves of flags, banners, and shields with various coats of arms, knights and squires dressed in richly embroidered cloth, priests releasing incense from brass thuribles, and soldiers in plumed helmets and chainmail, armed with spears, crossbows and halberds. From their breastplates to their buckles, the attention to detail is a marvel, like a legend come to life off the pages of a book, and I think of Robin Hood or the Knights of the Round Table. 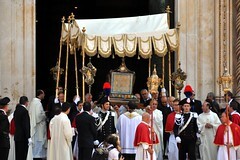 When the corporale makes its appearance at last, it’s under a white canopy trimmed in gold, seated upright in an ornate reliquary, richly decorated in enamel. The people lining the streets grow quiet and bow their heads in respect, many making the Sign of the Cross. An old woman leaning out of a window overhead applauds. Round and round they go, from Piazza del Popolo through the streets to the duomo and back. 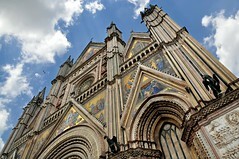 It’s a grand spectacle and one in which the citizens of Orvieto clearly take pride. In fact, I don’t think I’ve never been so grateful for the zoom lens on my camera. The experience aside—and it has been a memorable one—if I don’t walk away from this with some truly excellent pictures, it will be no one’s fault but my own. Once the service inside of the cathedral begins, the audio is conveyed on loud speakers to the crowd outside. The Italian that is spoken is lost to me, but the music—a mixture of sung hymns and traditional organ—most definitely is not. As the crowds disperse through the narrow streets, I settle in for a light lunch at L’Antica Pizzetta, where I order a plate of polenta with mushrooms, drizzled in olive oil, and a glass of the local white wine, known as Orvieto Classico. Afterwards, I drop by the tourist information office in the Piazza del Duomo to purchase a carta unica, which covers admission to nearly all of the city’s monuments. The Torre del Moro is my first stop of the afternoon, for its panoramic view, that blessedly comes with an elevator. I spend the rest of the afternoon pleasantly, again shopping for ceramics, visiting the market in Piazza della Repubblica and the rustic church of Sant’Andrea which faces it. By the time I make my way back to the duomo to examine its façade in detail—an astonishing mix of gold leaf, mosaic tile, and bas-relief sculptures—it’s open once again for visitors, and after a day of bright sunshine, I welcome the cool air and the dim light of the interior. The stone walls and massive columns that support the nave are constructed in green and white horizontal stripes and they are nearly as vibrant as the cathedral’s famous façade. Yet the highlight for me is the Chapel of St. Brizio, which features Luca Signorelli’s frescoes of the Apocalypse (1499-1502). I’ve seen imagery of this, and of the Last Judgment, before, countless times—on the wall of the Sistine Chapel, on the ceiling of the baptistery in Florence, on the St. John Altarpiece in Bruges, on a portal of Notre Dame Cathedral in Paris, and so on—so the writhing, naked bodies come as no surprise. But there is something fantastical here, something animated, that appeals to me and creates beauty out of misery and torment. 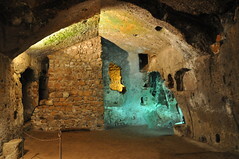 At 4:00 PM, I arrange to meet a guide named Anita for a group tour of the Orvieto underground. The city was built on a massive mound of soft limestone rock known as tufa, through which the Etruscans dug miles of caves, the rounded edges of which remind me of the Flintstone’s. In some rooms there are rows of small recessed holes in the walls. When Anita asks us to speculate on their use and purpose, we offer a variety of guesses. Some think the niches were used to store olive oil, others as a kiln for ceramics, and even a World War II bomb shelter. They were, she said, carved to create nests for breeding pigeons. As we make our way back up towards daylight, I have a decision to make. I’ve seen posters around town for a cavalcade at 6:30, where riders on horseback will parade in Piazza del Duomo, and there is bleacher seating being set up now. Should I stay? I would like to, but it’s been a busy day and energy is starting to flag. I decide against it, and head back towards the funicular for one last stop at St. Patrick’s Well. 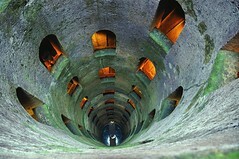 The well was built in the early 16th century and it’s famous for its clever, double helix design, which allowed people and livestock to descend down one set of stairs to the water at the bottom, while directing traffic up an entirely different staircase for the ascent back to the top. When my legs make it only part way down, and I am forced to retrace my original route, apologizing to the young woman at the ticket counter when I emerge from the wrong path, I know I’ve made the right decision to head back to Arezzo now, rather than staying late for the cavalcade. On the way back, I realize that I forgot to validate my ticket before boarding the train. I panic, remembering the stories I had read about the fines that are imposed. An old Brit onboard says, “I wouldn’t fuss about it, my dear.” And he’s right. The conductor never comes through the car to collect tickets anyway. Tired when I arrive, but grateful for my good fortune, I return to the same kebob shop along Via Guido Monaco and order a falafel to go. Just before I fall into bed, I remember the uncharacteristically harsh words Henry James wrote about Orvieto when he visited in the 1870s. He found it “meanly arranged and, as Italian cities go, not [a] particularly impressive little town.” It was, he thought, quite “inferior to its fame.” As I scroll through the pictures on my camera, I think that perhaps if he had visited during Corpus Domini, he would have changed his mind.